Oh, those winter months in Chicago.... we're snuggled up warm in the house tonight while the wintery mix of rain and snow carries on outside. I really should not complain that much, as we have had the second mild winter in a row and hardly any snowstorms at all. Although I would rather be dealing with snowdrifts tomorrow than the slushy sloppy puddles we'll be trekking through to get to work! The above photo was pinned from a tasty looking recipe on saveur.com from Wolfgang Puck, but it also reminded me of a pot pie recipe I saw on the cover of an old Cooking Light in my cupboard. I had a year subscription in 2007 and have found that those 12 issues are all I need to satisfy a craving for new meal ideas every few months! I dug out that issue and got to work. 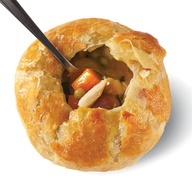 Although you can make your pot pie in a large crock or baking dish, we took advantage of the individual ramekins we own and filled them up with root vegetables and chicken, topped with a puff pastry crust. Absolutely delicious. A healthy dose of black pepper helps add a kick along with the parsley and thyme. Preheat oven to 400 degrees. Boil broth in a large Dutch oven. Add peas through onions to pan, cover and reduce heat to simmer. Add chicken and cook until done. Remove pieces of chicken and the vegetables from the broth and set aside in a large bowl. Increase heat to medium. In a bowl, mix flour - minus 1 tablespoon - with milk and whisk to blend. Add mixture to broth and cook until thickened, continuously stirring. Stir in chicken mixture, parsley, thyme, salt and pepper. I only had dried thyme and parsley so used less than the called for amounts. Once the mixture was ready, it was time to prepare the ramekins. Bob spread out the remaining flour on to wax paper and rolled out the dough. We used a pastry cutter to make rectangles to fit over the tops of the ramekins. After filling the ramekins and pressing to seal the pastry over the top, small slits were cut into the dough to allow steam to escape. The dough was sprayed with Pam and then set on baking sheets. We kept an eye on them as they cooked. The recipe says 16 minutes, but we have a touchy oven on the best of days. Once the pastry was browned we took them out and let them cool for a few minutes before digging in. So there it is, one of the best cold-weather cures for dinner! I'm linking this to the Pinterest Challenge that Young House Love and Bower Power seasonally put on. Definitely a departure from my usual home decor crafty endeavors (like these thumbtack balls or the most-intense-project-ever DIY shag rug from past posts). However, this past weekend I didn't quite finish the art project that I'm planning on unveiling as my next major Pinterest Project. Stay tuned over the next couple weeks for that big reveal! Let's just say I'll be using a whole lotta mod podge.